In South Dakota, you can get a badge for almost anything! As I have stated before, there is no credentialing of journalists in South Dakota. 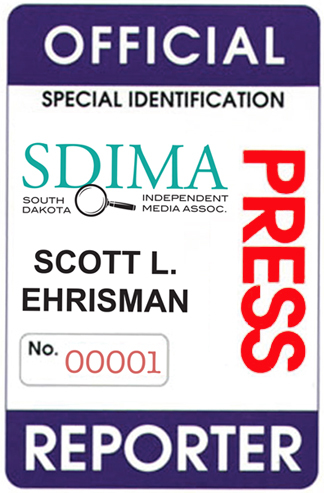 You can certainly belong to the SD Newspaper Association, you can also work for a TV station or newspaper in which you collect a paycheck. You can also have a degree in communications and journalism. But in SD, there is NO organization that will give you credentials. I find it ironic that a state legislature and governor’s office find it necessary that you have credentials to carry a pen, but you only need a holster to carry a gun. Their misunderstandings between the 1st & 2nd Amendments are astounding. The only credential you should need is a copy of the Constitution of the United States of America. MS – That is exactly what I told someone. Ironically, I do meet the criteria, I make money from the site and I have a communications degree. I would be curious if Siouxfalls.business would qualify since Jodi doesn’t belong to newspaper or TV station. Would love to hear her feelings on the matter. WP- Well you know what they say, the pen is mightier then the sword. The big difference between you and Jodi. She sites her sources, quotes them and reports facts. You sure share a great deal of info and although I don’t always agree with you I appreciate seeing your side of things. However you blog a lot of hearsay, and don’t always reveal your sources. You have many blog posts about a dacola foot soldiers told you this…. I heard from so and so that….. Heard a rumor about this…. That is not media or journalism. Show your cards, and start reporting facts and maybe more people would start to take you more seriously. So an anonymous commenter tells me I have to reveal my sources and use facts. That’s rich. LOL. One of the reasons I often post ‘half the story’ is sometimes the real sources and facts can be revealed. Many times if I were to say nothing, nothing would come to light. Sometimes you have to coax the facts and real story out of the darkness by baiting the hook. You are right, Jodi writes PAID for articles in the form of news, called ‘content advertising’. She admits it. She is NOT like me. She truly has the facts because her clients hand them to her to write the article, she isn’t digging for them. My point is that Jodi doesn’t belong to an established news organization, like a daily paper, printed subscription magazine or TV station, so is she still considered a credentialed journalist in SD? I say yes, but the legislature says NO.